Hannah Kidd, Tanya Brown, Avonside Drive series, 2015. Commissioned by SCAPE Public Art. Image courtesy of the artist and Milford Galleries Dunedin. Photo by Bridgit Anderson. Avonside Drive is a series of new figure sculptures by Hannah Kidd designed for SCAPE 8 New Intimacies, comprised of four characters: Mrs Parsons, Tanya Brown, Timothy Stableman and Noel Peterson. Each is an individual of Hannah’s creation; everyday heroes based on people Hannah witnessed in the Methven and Christchurch communities offering gestures of kindness, supporting others, or maintaining familiar routines following the Canterbury earthquakes. 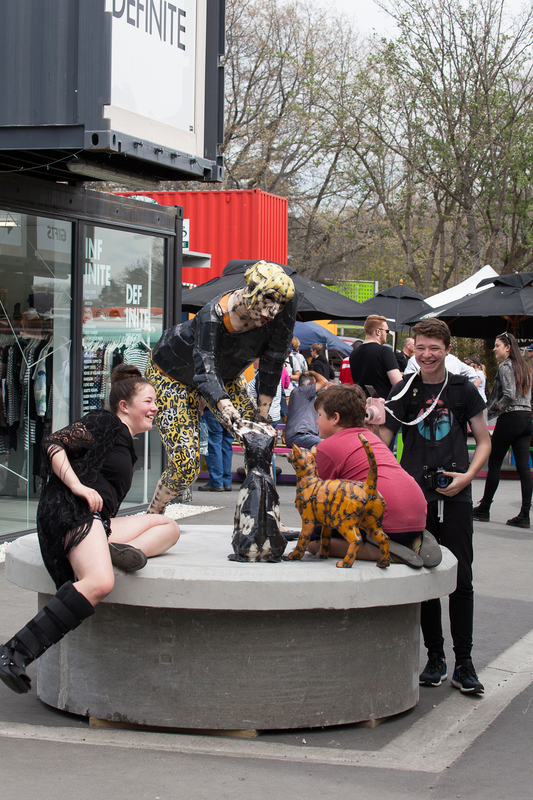 The figures have been installed in Re:START Mall, which has become a symbol of Christchurch’s regeneration and is a key meeting point in the central city. Re:START Mall is run by the Restart The Heart Trust, and was set up following the quakes to provide retail and hospitality services and the opportunity for Christchurch residents and businesses to come back into the central city. The figures of Avonside Drive represent a Christchurch community that is gathering strength and renewing its identity. The sculptures’ plinths – repurposed drainage sumps common to the rebuild – are the right height for sitting on; viewers are invited to linger with the figures, and to celebrate those in their own communities who keep on keeping on. Methven-based sculptor Hannah Kidd predominantly crafts and welds sculptural creations from steel rod and corrugated iron as a means to investigate people and the relationships they have with their surrounding environment. Hannah Kidd graduated in 2001 from the Otago Polytechnic School of Art with a Bachelor of Fine Arts majoring in sculpture. She has quickly risen to critical acclaim and her distinctive and unique work has been exhibited around the world, including I’m sure I’ve seen that before in Vienna, Austria (2002); Sculpture by the Sea, Australia (2007, 2009, 2011), and Sculpture by the Sea, Denmark (2009, 2011), along with numerous group and solo exhibitions throughout New Zealand. In 2010 she won the Montalto Sculpture Award, Australia, and the People’s Choice Award at NZ Sculpture OnShore, and in 2012 was a finalist in the Montalto Sculpture Award, Australia, and the New Zealand Wallace Art Awards.